Nature Two Very Surprised Antelopes! 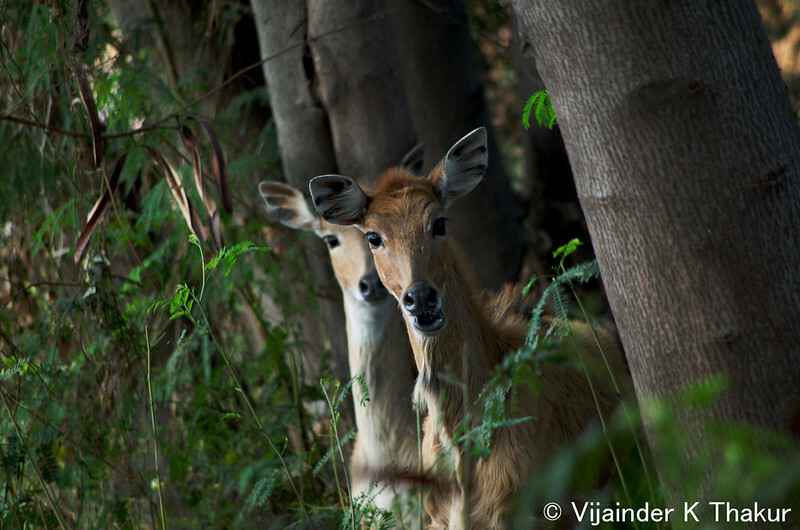 These Neelgai (antelope) females were startled to see me as they emerged from behind two trees. I was sitting on the swamp edge at Okhla Bird Sanctuary in New Delhi, India shooting birds. "WTF are you doing here?" they seemed to have said. Their expressions are so right on for coming upon you unexpectedly. Good catch. Nice capture! Love their expressions! Great photos....love the deer expressions. Thanks slowpez, jjdog2, civano, gifthorse, lesmore49 and tessfully. No doubt a lucky capture! The lesson for me is - I wouldn't have got it if I hadn't stepped out of my home. Great image. Love the composition and symmetry. Did you disturb them in the midst of something?